Sometimes, when a gigantic star reaches the end of its life, its inner core begins to collapse and it bursts out a cataclysmically powerful beam of energy called a gamma-ray burst (GRB). 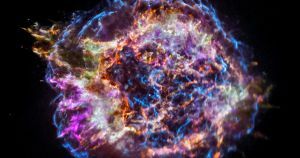 Along with the accompanying supernova, they can burn more brightly than an entire galaxy — some scientists have suggested that if one hit Earth, it could cause an extinction event. But that’s not always the case. When examining dying stars, astronomers often see a GRB followed by a supernova or hypernova, but sometimes they just see the supernova. Until now, scientists had no idea why the GRBs were missing from those stellar explosions. It turns out that when a star dies, it not only expels a gamma-ray burst but also a “cocoon” made of high-energy particles taken from the GRB itself. These cocoons sometimes grow so strong that they can actually block GRBs, according to research published last week in the journal Nature. The research suggests that every supernova may be preceded by a GRB. But sometimes the gamma-ray bursts transfer so much of their own energy to these cocoons that there’s not enough left for the GRB to break through, according to Astronomy. “The jet transfers a significant part of its energy to the cocoon and, if it manages to reach the surface of the star, will produce the gamma-ray emission that we know as a GRB,” Luca Izzo, an astrophysicist at the Institute of Astrophysics of Andalusia who conducted the research, said in an institute-published press release. If the gamma rays gave away too much energy to reach the surface of the dying star, which will then become either a neutron star or a black hole, then the GRB will stay trapped and it will appear as though the GRB never existed at all to any astronomers watching the spectacle.